The money will be used for program scholarships, equipment and facility upgrades. The Diesel Tech program was launched in 2016 to give high school students the opportunity to take classes that put them on the path to a technician career. After graduation, a student can participate in a paid internship with an industry partner, then go through further training at one of the secondary education partners. Industry partners include C.R. England Inc., Cummins Rocky Mountain, Geneva Rock Products, Komatsu Equipment and the Utah Transit Authority, in addition to Kenworth Sales. “I saw (the school’s) commitment and thought, ‘I can get behind that. I can commit when I see that there are others going in the same direction,’” Kenworth Sales President Kyle Treadway said. Salt Lake Community College President Deneece Huftalin said the donation makes an important statement. The Westpointe Center is a $43 million, 121,000-square-foot facility that will open in the fall. The college focuses on workforce development programs and counts more than 60,000 students each year. The diesel technician shortage is a major issue for trucking, Treadway said. 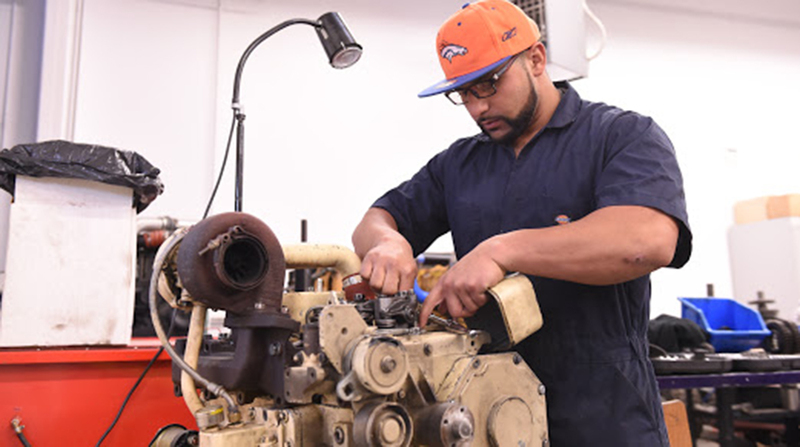 Over the next decade the industry will need as many as 75,000 new diesel technicians due to baby boomers retiring and industry growth, according to the Bureau of Labor Statistics. Diesel engine technology now requires highly educated technicians to handle the equipment and engines, he noted. West Valley City, Utah-based Kenworth Sales sells and services Class 6, 7 and 8 trucks at 22 outlets in Idaho, Montana, Nevada, Oregon, Utah, Washington and Wyoming.